I was given some Rowan Cashsoft DK in Sweet (that really is the colour name) and decided to make aÂ Liesel scarfÂ for a friend. When I swatched, I liked the shape of the start, which forms a nice curve, but not the ending, so I decided to knit the scarf as two halves and graft them together. 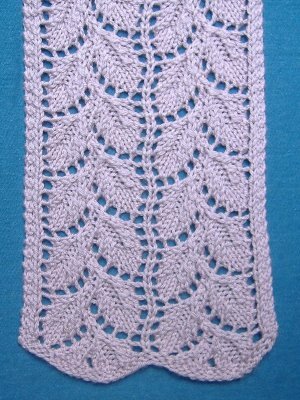 The grafted section does not like quite as good as I hoped, but I think it is OK.Â I considered stopping each half 2 rows before the end of the pattern repeat to make that section shorter, but that would cause problems with the purled centres of the leaves. 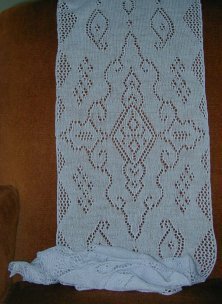 I used 4.5mm needles, and the scarf took 132g (375 yds).Â The scarf was blocked to 7.25″ wide and 77″ long, but shrunk to 6.5″ by 72″ once unpinned and allowed to relax.Â Even though my friend likes long scarves, I thought that was plenty long enough, but I still had some yarn left, so I decided to make some fingerless mitts to match.Â I knitted them ‘top down’ to use that nice curved edge over the back of the back of the knuckles.Â I did them on 4.00mm Brittany dpns, as I thought they needed a firmer gauge. 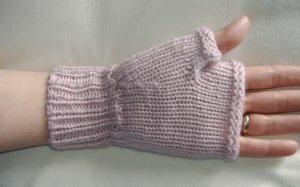 My friend’s hands are smaller than mine so they should fit her a little better.without the cuff creeping over the base of the hand.Â I did the thumb gusset slightly towards the palm – you can see the shaping better on this picture, which also shows that the ‘straight across’ top on the palm side doesn’t interfere with bending the hand, while the curved top on the back gives a bit more protection to the fingers.Â They only took 30g (85 yds) of yarn for the pair. Well, Sivia Harding has renamed her design Angel Pearls, but I prefer the original name, which is what it says on my copy as I have had it for quite a while, waiting for the right occasion. 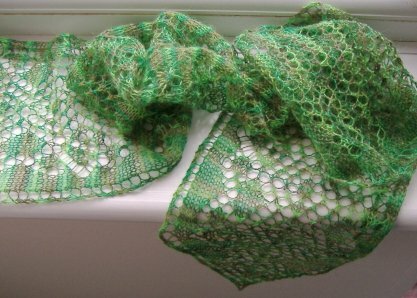 Many, many moons ago, a group of friends who met regularly on IRC decided to have a scarf/shawl exchange.Â Opal and I drew each other.Â Opal decided to tackle the Fan-Stitch Half-Circle shawl from Waterman’s Traditional Knitted Lace Shawls, which was an ambitious project for her then.Â She is a much more experienced lace knitter now, as you can see from the lovely shawls she has completed recently.Â Anyway, back then it was a challenge for her, but it was going well until one of her cats decided to … um …Â water it.Â Although Opal washed the yarn and the work-so-far, it dampened her enthusiasm and the WIP became a UFO. Blocked size:Â 44″ by 22″.Â but I expect it to shrink a little when it relaxes. It has turned out to be a shoulder shawl, just reaching my elbows and just below my waist at the back. 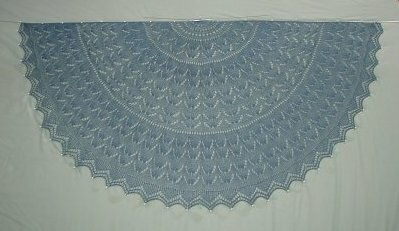 My mother mentioned a couple of months ago that she would like a small shawl to use as a ‘bed jacket’, so this one wlll be going to live with her this weekend.Â This is good timing as she is in pain from polymyalgia in her shoulders, and needs a little extra warmth around her shoulders without a lot of weight. 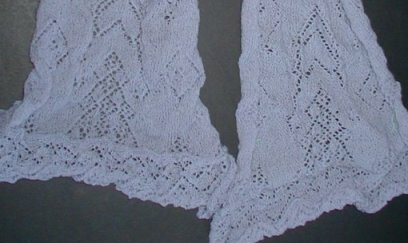 “What”, you may be asking, “is Scheherazade?” It is the official name of the Mystery Stole 2006, and a very appropriate one too.. I finished it on Friday, but I couldn’t block it till Saturday, and then this site was down, so I’m a little late blogging it. I’m very pleased with it. 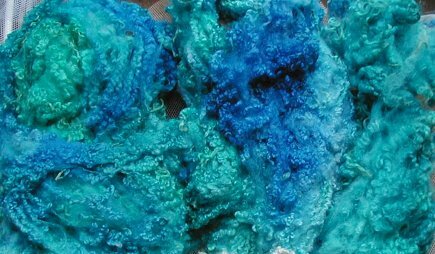 Although the close-up pics still make it look quite solid, it is actually fine and floaty and airy. Scheherazade was designed by Melanie Gibbons. 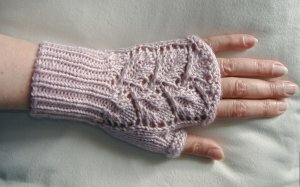 I knit mine in Skacel Merino Lace (6120 ypp), which I would call nearer cobweb than laceweight. It took 810 yds (60g, 2.12 oz) using 2.75mm (US #2) needles. 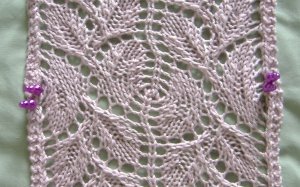 Melanie predicted that the finished size when knit in Zephyr laceweight on #3 needles would be about 20″ by 72″. 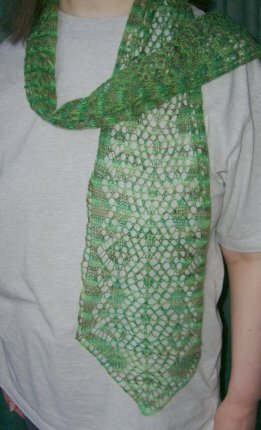 I knew mine would be smaller, so I planned to block it as a scarf, keeping most of the length but letting it be narrower. 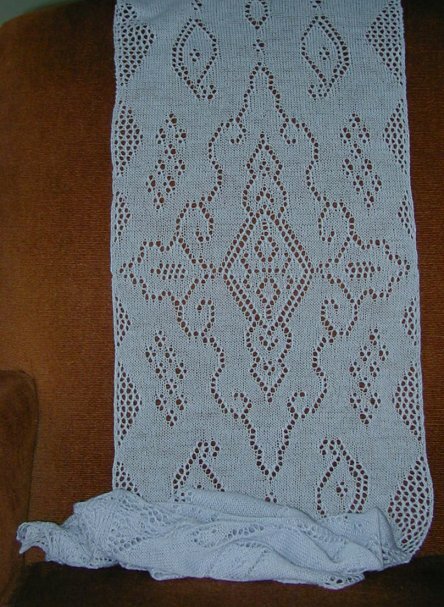 Before blocking, it was only 13.5-14″ by 56-60″, but I blocked it to 14.5-15″ x 79″. After unpinning, it has shrunk back to 13″ by 71″, which I think is a good size for this type of scarf, and I doubt that it will shrink more now. I’m including a shot of it before blocking, just because I’m always surprised by just how much difference blocking makes. The first two pictures give the most accurate colour on my monitor, though they are a little bluer than the real thing. Click on the picture above to get a close-up shot. 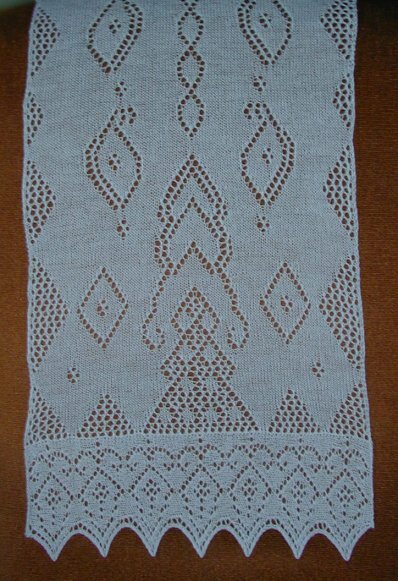 I only swatched the last few rows of a section of the body (bottom of picture) and a few stitches from the ‘inside’ part of the edging. The full edging is going to be beautiful! The swatch is dry-blocked. 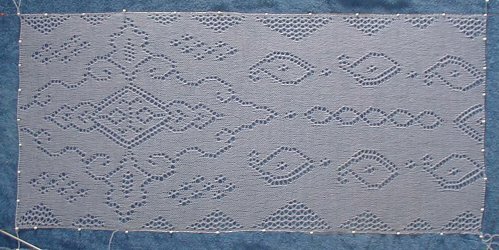 The right half of the swatch is done as given in the pattern, the left half has two extra plain rows in the body before starting the edging. I prefer the pattern version. I do have some doubts about the start and end of the edging, though, which I will raise in the discussion group. I’ve finished Clue 4, side 1,which means I’m up-to-date with the clues, but on side 2, I’m only a little way into Clue 2. I’ve been slowed down by knitting a pair of socks for my mother’s birthday (she wanted short, plain, boring, so no pics) but I’m planning to spend all this week’s knitting time on the MS2. I’m hoping at least to finish Clue 3 before Clue 5 comes out next Friday. I have both ends on a single circular needle, but I knitted one end off onto a spare one so I could pin the stole out for a progress photo. I used blocking wires down the sides this time. At the moment, it is 31″ by 14″ stretched fairly hard. From a quick calculation, [edited from this point after a hasty recalculation] if I block it about as hard as I stretched it today, it should end up about 14″ by 72″, which is close to what I hoped. 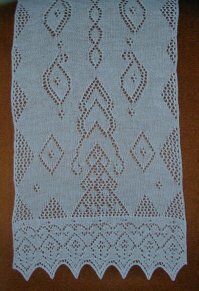 I have the next clue finished now, though I’ve still only done 6 rows of the second side as I’ve been having to share my knitting time between this and my mother’s birthday present. I’m hoping to catch up more second half rows as I wait for each new clue to come out, and have clue 5 finished on both sides by the time clue 6 comes out. Although the picture shows it on two circulars, that is just for the photograph. I’m actually knitting both ends on the same needle, which I haven’t found a problem so far. 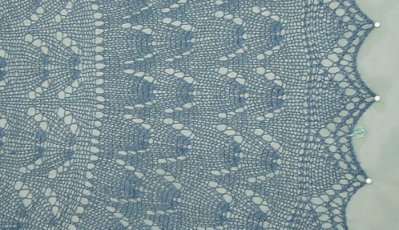 Pinned out dry, it is about 14″ x 12″. 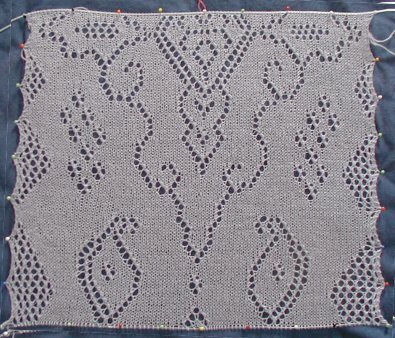 I’m deliberately blocking it to be somewhat longer and narrower than it might naturally be as I want to keep as much of the original pattern length as possible even though I’m using finer yarn and smaller needles. I finished the first side of the first clue last night, but I decided to leave picking up the stitches for the second side till this morning. Once I’d picked up the stitches from the provisional cast on, I took the opportunity to get a photo. As before, it looks a lot lacier in real life, and of course it will be lacier still once it is wet-blocked. I’m really enjoying this project. 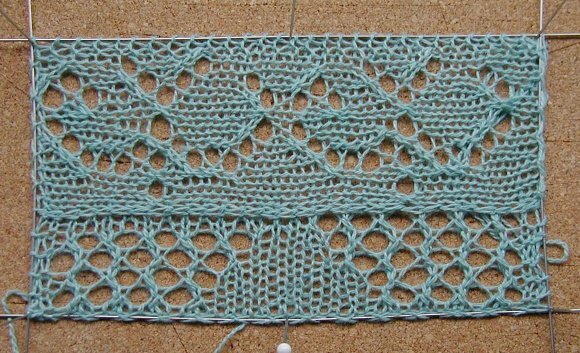 I rarely knit this sort of lace with a design ‘drawn’ with eyelets on a stockinette ground, so it makes a change. I am now knitting with both ends of the stole on a single 32″ circular needle. After 4 rows of the second half, I’m not finding that as awkward as I thought I might. It would be a little easier with a longer needle, but this one has a more flexible cable than any of my longer ones, so I still prefer to use it. I don’t think I’ll get the second side of clue 1 finished before the next clue is released tomorrow as i have to concentrate on getting another slipper knitted in time to let my mother try it on tomorrow. I’m using Patons Diploma Gold this time. 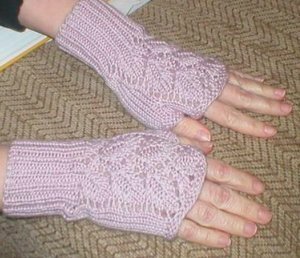 I used it for her socks and it seems to be wearing better than the Sirdar Country Style which I used for the previous pairs of slippers. Although they are both classed as DK yarns. the Diploma seems much thicker and firmer, so I’m having to adjust the pattern again, hence the need for fittings. I want to get at least one pair done by her birthday in 2 weeks.